For 38 years, when Santa’s too busy to make it to Revelstoke, Don Crawford has been the man who’s called upon. 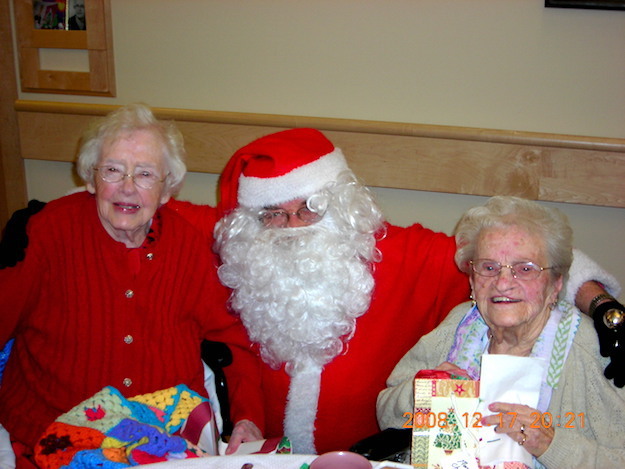 Don Crawford is Santa when the real one can't make it to Revelstoke. For 38 years, when Santa’s too busy to make it to Revelstoke, Don Crawford has been the man who’s called upon. He shared some of his stories from playing the role. Christmas was not a big deal for Don Crawford growing up on a hard-scrabble farm near Salmon Arm. It was him, his younger brother and his father; his mother left them when he was very young. He knew about Santa Claus, but they didn’t go visit him at the mall or anything like that. “We had to work at home to survive so we didn’t have time for that kind of stuff,” he said. Crawford would more than make up for it later in life when he started dressing up as Santa Claus in Revelstoke. It’s a role he’s played for almost 40 years. Crawford was born in Penticton but grew up in Salmon Arm. After finishing high school he worked as a cabinet maker, but when business slowed down, a friend got him a job at Superior Building Supplies in Revelstoke in 1964. The store was located where the post office is now. He spent four years there, during which he courted his wife of 48 years Geri — a born-and-raised local. “I saw her going to school and thought she was the doll for me,” he said. They got married in June 1968 but at around the same time, Don got a new job working at a store run by the Emissaries of Divine Light, a religious group in 100 Mile House. For a few years, he commuted between the two cities before eventually getting a new job for Coop Hardware in Revelstoke. He spent a few more years in retail and also delivered milk before getting hired on as a school bus driver for the Revelstoke School District in 1978. He did that for 23 years. Around that same time, he got a request from a women he knew. The woman wanted Crawford to go to the train station and greet her grandchildren when they got to town. When he showed up, the kids wondered how Santa knew where grandma lived. The job made him happy and he kept doing it. He got invited into schools and seniors homes, dressed as Santa. The kids would sit on his knee and he would dance with the old folks. Young and old, they delighted in seeing him. He’s been Santa everywhere except for the parade. He’s gone out for Moonlight Madness to greet people at local stores. He’s gone into schools and heard the kids wishes. He’s been there for breakfast with Santa at the United Church and at the Revelstoke Railway Museum’s Christmas party. He’s made visits to house parties and friends’ homes, and done photos with the Revelstoke Grizzlies. He has his own Santa Claus outfit that was made for him by Jean Madlung about 25 years ago. It’s a vivid red, with white trim. “It’s perfect,” he said. When he puts on the beard and hair, people don’t recognize him. There are memories that stand out, many of them touching. There was the time Crawford was asked to visit a young girl while she was sleeping. His memory of the occasion was vague, but he recalled she had some problem and so he went in and put a flower on her bed. “When somebody that size says that, he isn’t even thinking about presents, it’s hard,” said Crawford. Crawford loves dressing up as Santa. This year, he had to pull back from his obligations because of health issues, but he still made it to the railway museum’s Christmas Party. He said parents like to get their photos taken with him, and I mentioned how excited kids got when they saw Santa at the Miracle on Mackenzie earlier this month. I asked why he thought people loved Santa so much.